There’s currently a fair bit of nostalgia around for Italia ’90 as the tournament took place this time 25 years ago. Our next few blog posts will focus upon that competition and we begin by recalling what it was like to watch ‘on the box’ in the UK, focusing mainly today on the early stages of the competition. Mention Italia ’90 to anyone who watched it in the UK and there’s a fair chance Nessun Dorma will soon crop up in nostalgic discussion. The BBC made a fairly bold choice to start each broadcast with Luciano Pavarotti’s operatic recording – there was a risk the stereotypical football fan would loathe it, while the opera buff could resent seeing it used for a sport which had developed a poor image in recent times – but it couldn’t have worked out better all-round. Pavarotti developed a new-found success, the BBC’s coverage was lauded thanks to the tune and there was now a greater and wider appreciation for opera thanks to millions hearing it every day. Given the simultaneous success of World in Motion, football and music have rarely seen so intrinsically linked as they were in the summer of 1990. Presenter Des Lynam certainly could see the potential in Nessun Dorma. “You’ll be humming it soon – you’ll know the words to it by July 8,” he said as the first BBC broadcast began on June 8. And he was right. The situation was parodied in an early episode of the Channel 4 comedy Drop the Dead Donkey a few weeks later, where the equivalent of a swearbox was installed in the newsroom for anyone humming it. You couldn’t go far without hearing Nessun Dorma that summer and Pavarotti would soon be presented with a platinum disc by the BBC’s Bobby Charlton as sales rocketed. Pavarotti could forever be grateful for what the BBC had done to further enhance his career and popularity. Reaching number two in the British singles chart in 1990 probably wasn’t something he anticipated when he recorded Nessun Dorma 18 years earlier anyway! In a tournament that was defined more by memorable images than classic matches, the song fitted perfectly over any montage of Italia 90’s standout moments. But the song’s association with the competition could easily have never happened had BBC’s senior sports editor Brian Barwick not stuck to his guns. In his book Are You Watching the Match Tonight? Barwick recalled being called by a bigwig from the record label a couple of days before the tournament began, informing him they were having second thoughts about the song’s use. Barwick made clear they would not be backing down and stressed they would soon see the success of the song being heard day after day. How right he was. By 1990, Lynam was peaking as a broadcaster and he was in his element hosting the BBC’s coverage from the London studio. He had fronted the BBC’s coverage of Mexico ’86 and Euro ’88 and his reputation in football circles had grown further by presenting Match of the Day from 1988-89 onwards. His mixture of charm and confidence and a laid-back manner proved a winning formula with both male and female viewers and he was helping bring the best out of his pundits. They included Jimmy Hill and Terry Venables, who were starting to develop their routine as the proverbial old married couple who would constantly argue. One thing they did reach agreement on was they believed John Barnes had correctly been flagged offside when he scored for England against Belgium, with Lynam taking great delight in presenting television evidence which he believed showed they were wrong. Des Lynam at home in the BBC studio, joined by sparring partners Jimmy Hill and Terry Venables and the injured England skipper Bryan Robson. Apart from Lynam venturing to the stadium for the BBC’s live coverage of England against the Dutch, the BBC presented its coverage of the group stage and second round from London. But ITV seemed caught between wanting to be there and the comfort of presenting from back home and they came up with an awkward mix. 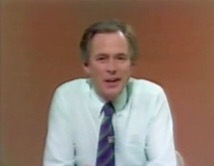 Nick Owen was in the London studio and Elton Welsby was in the stadium, without an on-site studio to protect him from the noise around him. Often Welsby seemed to be quite frantically pressing his finger against his earpiece to catch whatever was being said from London. The two-man ITV presenting team of Nick Owen (top) and Elton Welsby. Both men would suffer by comparison with Lynam and struggle to match his on-screen authority, although the pair got off lightly compared to Matt Lorenzo four years later. 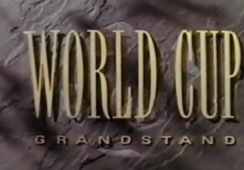 In keeping with the rather ‘Marmite’ nature of the 1990 World Cup, ITV’s theme tune and opening titles divided opinion. Some loved it, others felt what they saw and heard had no right to compete with the BBC’s Nessun Dorma. Again, what the Beeb did was ITV’s main undoing. Although not without faults, this wasn’t so much a tournament when ITV’s coverage was hideously bad but more one when it was never going to come close to matching a rampant BBC. 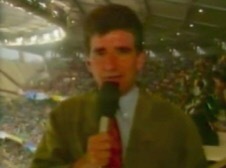 Brian Moore was finally commentating on a full World Cup tournament, bravely carrying on describing West Germany’s 5-1 win over the United Arab Emirates amid fears he and co-commentator Trevor Francis could be electrocuted as a thunderstorm took hold in the San Siro. But Moore’s presence was missed a bit in the studio. Indeed, ITV’s coverage was perhaps most defined by who wasn’t there rather than who was. The ever-opinionated Brian Clough was the most notable absentee from the punditry team, while Martin Tyler – who had commentated on every England match at the last two World Cups – had been lured away to satellite television where he remains today. Jimmy Greaves spells it out. ITV had brought in Emlyn Hughes and Rodney Marsh as opinionated pundits and England manager-in-waiting Graham Taylor played a fairly prominent role. 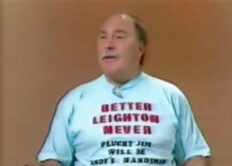 But right in the middle of the coverage sat Jimmy Greaves, who in each broadcast would wear T-shirts containing ‘witty’ slogans such as ‘Better Leighton Never’. In this episode of Saint & Greavsie he even changed shirts at half-time as if to press home the value of the plays on words. Whoever’s decision it was, the fashion statement for Greaves that summer did little for the credibility of ITV’s reputation as a serious football broadcaster (but this blogger remains a big fan of Greavsie’s – get well soon). Not that it was all jokes and laughs for Greaves that summer, becoming quite outspoken on the punishment dished out to Swindon Town over irregularities. 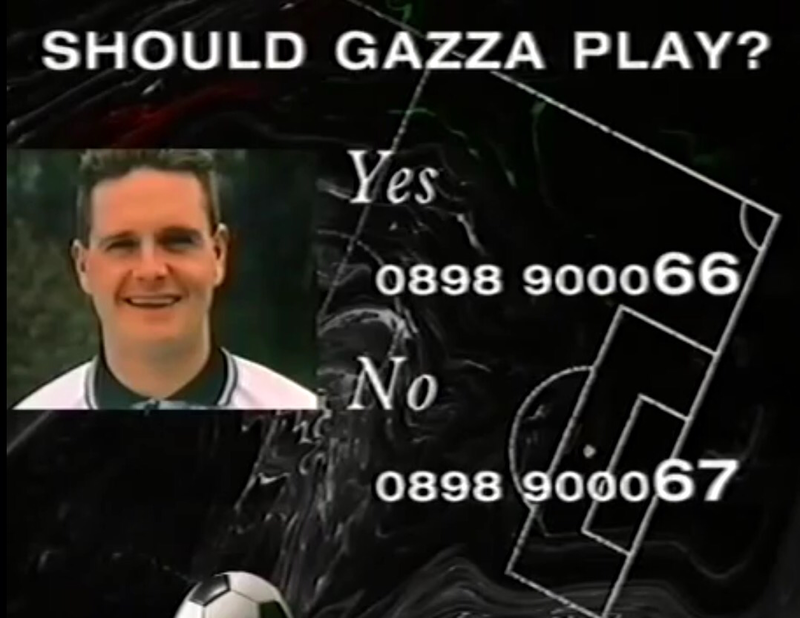 Other distinctive elements of ITV’s coverage included phone polls and the coverage being “in association with National Power”, with this advert seen over and over again. Although the tournament felt less commercialised than today, there were certainly hints it was going that way with a major tournament sponsor even given some publicity in this interview with Bobby Robson as he enjoyed a can of Coca-Cola. Television was becoming increasingly powerful in football by 1990, but it wasn’t quite the great god it now is. During the World Cup group stage, there were 11 instances of two matches being played at the same time. In the pre-red button era, this meant the other match could not be seen live (unless you were in a minority with access to Eurosport for some of those matches). The problem in Britain came to a head on June 16, when England and Scotland played matches at the same time; then due to being in the same group England and Ireland played matches simultaneously five days later (that would still be the case today, but in such circumstances now the other match can be accessed far more easily). I never understood why on certain occasions like that agreement could not be reached for the BBC to show one match and ITV the other, particularly as seven of the last nine matches in the knock-out rounds ended up being screened live by both of them so the channels were not afraid to go up against each other. There were also some instances of football not totally dominating the schedules, with hosts Italy’s primetime group stage match with the USA not shown live by either the BBC or ITV despite it not clashing with any other match. The same would happen a few days later when there were two matches in Group E played at the same time but not screened live, while the BBC only joined live coverage of West Germany against Colombia at half-time. That was the only time any of Colombia’s group games were live on terrestrial television in the UK, while the talented Yugoslavia were not afforded any live coverage on the BBC and ITV during their opening three matches. Hard to imagine today.